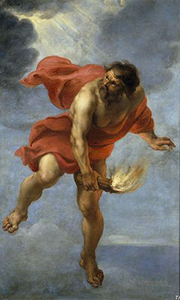 According to the ancient Greek mythology, the Titan Prometheus in a moment of generosity (and not caring about the consequences) decided to steal fire from Zeus himself in order to give it to humanity. This selfless act thus enabled progress and civilization. Since this moment, humanity has exploited these resources in every possible and imaginable way: heating, cooking, manufacturing and, of course, lighting. The latter, especially in the indoor area, saw the most transformations over the last centuries. Torches, oil lamps, candles and gas lamps are objects that have the power to illuminate domestic environments thanks in part to fire… although everything changed in the year of 1879 with the invention of “his majesty” the Light Bulb. In the last two centuries the discipline known as Lighting Design was born and eventually evolved to become an official branch in the Design scene. Light Architects and Industrial Designers developed new solutions every day to illuminate certain environments, always taking into account two fundamental factors: Light and Emotion. If on one hand artificial light allows us to see even in the darkest of the environments, on the other hand it can be used as emotional support in the shape of art. A soft light helps us be less shy, while a light with different colors can allow us to bring out one side of our character that we tend to repress when we are illuminated by the sun. When we speak of indoor lighting we can distinguish mainly two categories of luminous bodies: Technicians and Furniture. In the first category are all those luminous bodies that are designed with the purpose of not being observed as much, such as led strips, spotlights and all the various hidden solutions. The second category includes all different types designed to be a visual part of a specific environment: desk lamps, bed lamps, chandeliers and floor lamps. Almost always these elements are formed by a fundamental element that is its most characteristic part. Whether it is conical, cylindrical or any other shape, this element is the hat that almost entirely characterizes and interior lamp. Form, material, transparency, color and size on one hand, the production process on the other. Putting these factors together defines the lampshade and consequently the lighting and the characterization of an environment. As stated in the first article, the purpose of this section will be to guide you through the world of Parametric 3D Modeling applied to product configurators and digital manufacturing. For this reason, in this second appointment with Parametricisim we will examine the collection “Trame Nascoste” by Digital Fucina. 1. All models where created entirely with Parametric 3D Modeling. 2. These lamps were designed with the purposed of being completely editable via a Product Configurator. 3. Each product was designed with 3D printing processes in mind, highlighting the benefits versus traditional manufacture processes. Let’s take as an example the lamp Clam by Laura Tardella, a lampshade whose simple lines hide an unexpected soul. Clam exploits and highlights the characteristics of 3D Printing using studied cavities within its thickness to create a totally invisible weave. The result is a magical and unexpected effect, in which the apparent linearity and softness of the surfaces reveals its true identity only through light. Viewing on a Mobile? Please tilt your phone! – Helps you own a truly unique piece. – Shortens the distance between supply and demand, customer and producer. – Minimizes waste and avoids wasted spaces in warehouse or storage places.